“One night late in the fall of 1933, a lanky youth with a mop of dark hair entered a night club on Chicago’s north side and asked the waiter for a table near the band. He sat down took out a stick of gum, popping it in his mouth as he watched the show. He drummed on the table with his fingers. The dancers were running through a routine based on Liszt's First and Second Hungarian Rhapsodies. To watch the dancers and watch the conductor, too, in show work, everything depends on the drums. Gene Krupa stayed late that night even though he had to get up for a rehearsal the next morning. Like many of today’s great drummers, Krupa was serving his extra-curricular apprenticeship with Baby Dodds. Among the drummers who have asked for that stuff are Dave Tough of the Eddie Condon Band, George Wettling with Paul Whiteman; Ray Bauduc, Wally Bishop and Ben Pollack have all sat by his side. Jazz drumming has come so far today in terms of technique and complexity that few listeners ever pause to reflect on those that started it on the path to modernity. Horn instruments in the hands of Louis Armstrong, Coleman Hawkins, Jack Teagarden made possible examples of how to develop facility on the trumpet, tenor sax and trombone, respectively. Earl Fatha Hines, Thomas Fats Waller and Art Tatum became beacons for those pianists who wished to bring their technical skills on piano to a higher level as did the work of string players such as Joe Venuti on violin and Eddie Lang and Django Reinhardt on guitar. Gene Krupa and Buddy Rich gained a large measure of public attention for the stylistic advances that they brought to Jazz drumming but, sadly, too few Jazz fans are aware of the foundation upon which their drumming wizardry is based. 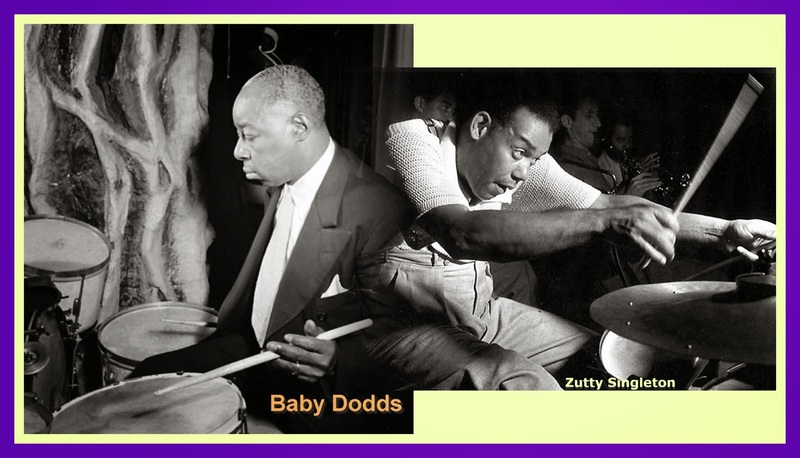 The editorial staff at JazzProfiles thought it might be fun to reflect back on the careers of two drummers who provided the building blocks upon which early Jazz drumming technique is based: Baby Dodds and Zutty Singleton. 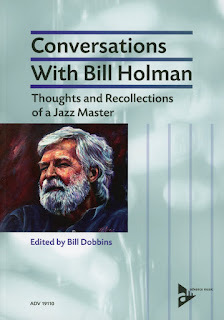 We are indebted to a variety of sources for the following information including the Moderndrummer and Drummerworld websites and Len Lyons and Don Perlo’s Jazz Portraits: The Lives and Music of the Jazz Masters. 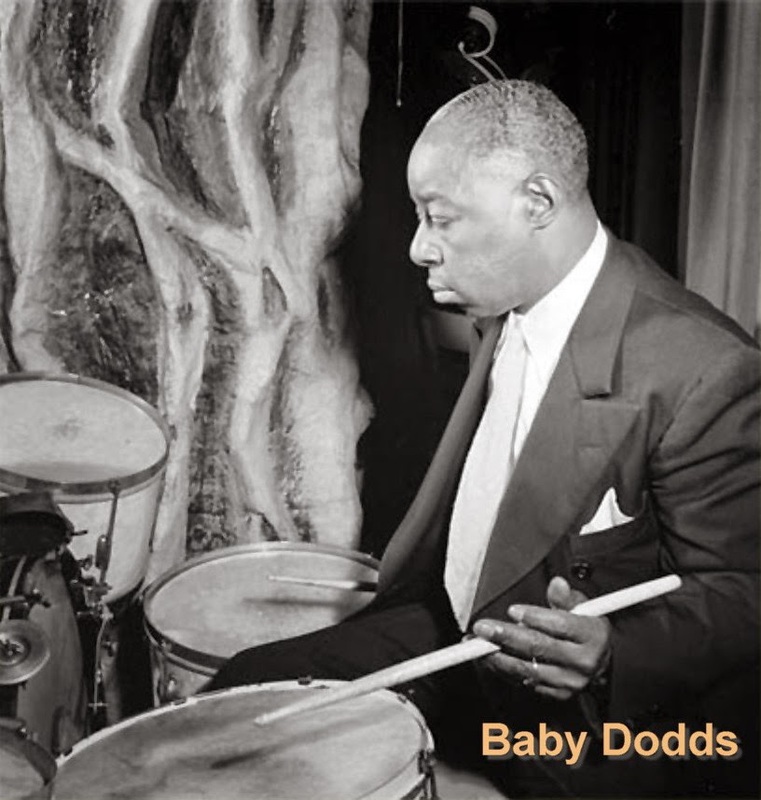 Warren “Baby” Dodds was born in New Orleans on Christmas Eve, 1898 and died in Chicago on Valentine’s Day, 1958. 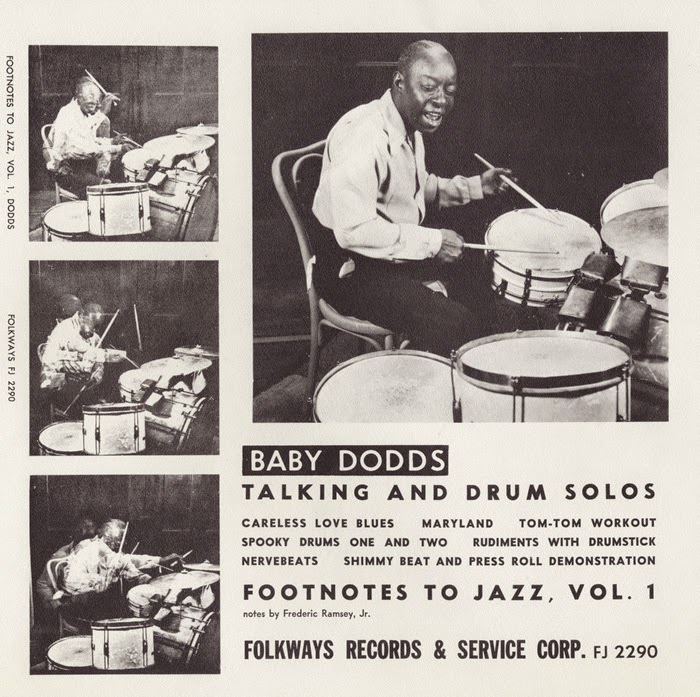 Dodds, a hard-drinking, hard-fighting musician in his youth, and is considered by many to be the Father of Jazz Drumming mainly because he defined many of the criteria by which future drummers would be judged. Although he was inspired and influenced by parade drummers like "Black Benny" and Mack Murray, and Creole bandleader Louis Cottrell, Sr., Dodds popularized the steady of the bass drum in ensemble playing, a style that persisted until 1940 and long after in traditional jazz groups. Dodds also proved that tuning the tom-toms and snare to the other instruments in the band was essential. In addition to these innovations, he is credited with keeping an early form of the ride rhythm on the snare drum. During the 1920s, Dodds’ recordings with King Oliver's Creole Jazz Band, Louis Armstrong's Five and Hot Seven, and Jelly Roll Morton's Red Hot Peppers made him the most famous and imitated of jazz drummers. 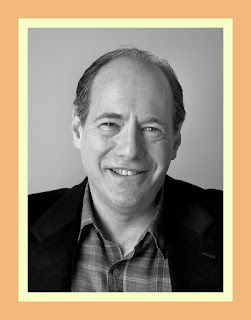 The youngest of six children, and bearing the same first name a father, Dodds was called "Baby" from his earliest years. Everyone in the family played an instrument, and Baby's older brother Johnny was a prominent clarinetist. 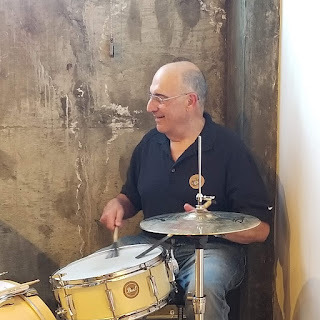 Baby created his first snare drum from a lard can, removing the dowels from a chair for a pair of sticks; he kicked the baseboard wall to get a bass-drum sound. On this jerry-built kit, he first accompanied Johnny. At sixteen, Baby worked as a butler and salad boy and saved to buy first drum. He studied music with a well-known local teacher, Dave Perkins, who taught a racially mixed class, an extraordinary arrangement even for New Orleans. Baby was soon playing for dances, at picnics, and on the band (advertising) wagons with Louis "Big Eye" Nelson, Bunk Johnson, Papa Celestin, Frankie Dusen's band, and other local groups. He was developing a longstanding rivalry, born of admiration, with Johnny, who worked with King Oliver and Kid Ory in more prestigious bands. In 1918 bassist George "Pops" Foster got Baby a job in the riverboat bands, where the drummer befriended the young cornetist Louis Armstrong. Dodds's technique improved radically with the demands of constant performing, and he was soon known for his press roll and his ability to get varied tonal coloration from the trap set, which then included a good supply of novelty instruments, like whistles, wood blocks, triangles, and tambourines. During 1921 Dodds and Armstrong were notorious crowd pleasers in Fate Marable's band, but in 1921 they were dismissed from the riverboat line for their intractable offstage behavior. Dodds was known as "a real hellion" who would "fight at the drop of a hat." In 1922 Dodds was invited to join King Oliver's Creole Jazz Band, which had just returned to Chicago from the West Coast. When Armstrong was added as second cornet the next year, the group — which also included Baby's brother Johnny on clarinet — became the most influential small combo in jazz. Descriptions of Dodds's style emphasize its complexity, especially his use of varied tonal colors and sensitive accompaniment to whatever mood and spirit was struck by the band. Interestingly, Dodds resisted using wire brushes until later in his career, although he was able to play very lightly with sticks. He considered it imperative to fit in with the context. 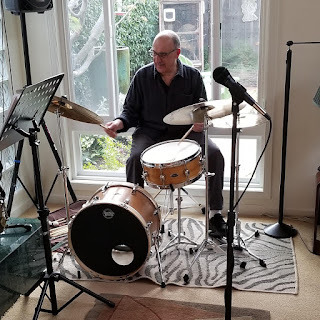 In short, Dodds was perhaps the first to demonstrate what has since been taken for granted: that the drummer could be, and must be, a full-fledged musician. Shortly after Armstrong left the group to make his own name, Oliver's band broke up because of disputes over record royalties. During the remainder of the 1920s, Dodds's influence grew so that his dense sound, full of color and special effects, exemplified the state of the art for that period. Unfortunately, the famous disks that Dodds made with the Hot Five, Hot Seven, and Red Hot Peppers (1925—27) do not reveal how he played because the primitive recording techniques were unable to capture the drums' sound. Until the 1930s, drummers were prohibited from using a bass drum and in general kept to the wood blocks, or one cymbal, sitting as far from the microphone as possible. Dodds's style, however, has been preserved by the descriptions of critics and the many drummers he influenced, a group that includes Zutty Singleton, Ray Bauduc, George Wettling, and Gene Krupa. Dodds free-lanced for the rest of his career. 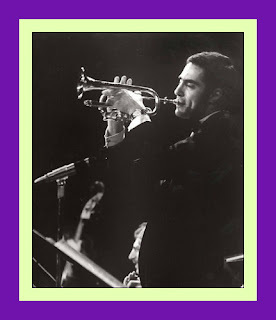 His most important playing was done with his brother at the Three Deuces in Chicago and with the many white traditionalists for whom he was a major hero: Paul Mares, Mezz Mezzrow, Jack Teagarden, Eddie Condon, Jimmy McPartland, and Art Hodes. 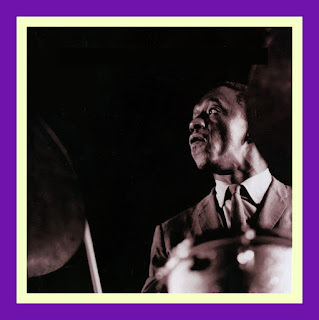 By that time, there were younger drummers like Singleton, Big Sid Catlett, and Chick Webb, who were evolving the drummer's task as outlined by Dodds. Dodds worked with Jimmy Noone and Sidney Bechet in the early 1940s. In 1944 he was incorporated into the New Orleans revival as accompaniment to Bunk Johnson, and in 1946 he recorded drum solos and narration for historian Fred Ramsey in order to recapture the sound of jazz drumming in Chicago of the 1920s and in turn-of-the-century New Orleans (The Drums, Folkways). Overweight and drinking heavily, Dodds suffered the first of several strokes in 1949. But he continued to play in the Chicago area until two years before his death, in 1959. Arthur James “Zutty” Singleton was born in Bunkie, Louisiana on May 14, 1898 and died in New York City on July 14, 1975. 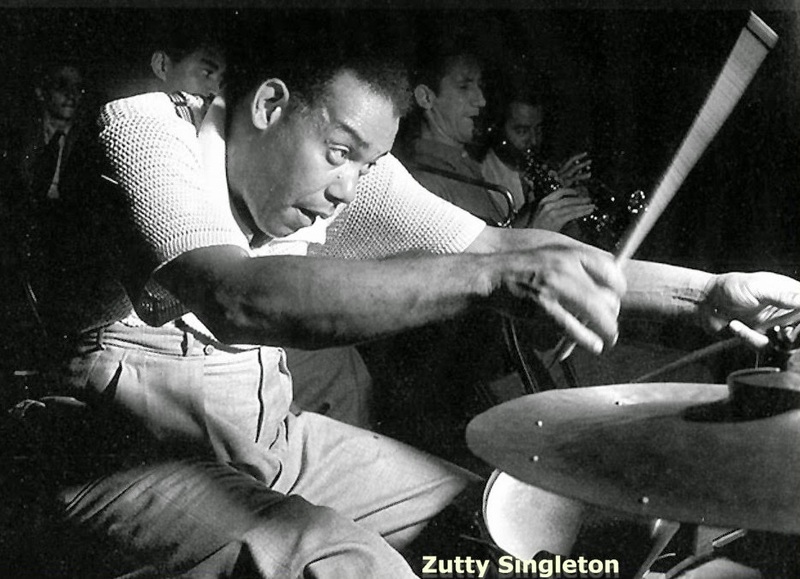 Zutty Singleton’s drumming served as a transition between the dense, heavy style of Baby Dodds and the lighter swing style of Jo Jones and Big Sid Catlett. Singleton simplified not only drumming but the drum set itself, which was outfitted by most traditionalists with a colorful if cumbersome array of novelty percussives. Zutty also pioneered the drum solo, though on a modest scale, and the use of wire brushes to achieve a softer sound. The family moved to New Orleans when Zutty was a boy, and he inevitably was drawn into the local music scene. He is known to have worked in the bands of Steve Lewis and John Robicheaux (1915—16) before his hitch with the navy (1917-18). 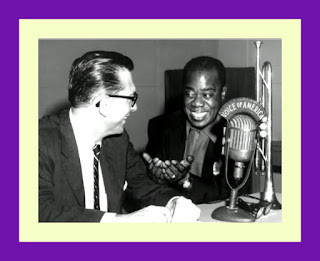 Zutty had a close friend and bandmate in Louis Armstrong, with whom he was destined to make his historic contribution. The two were so close that Armstrong turned down a flattering offer to work in New York around 1920 because Zutty could not be hired along with him. Zutty later followed Armstrong into one of Fate Marable's riverboat bands (1921—23), where nightly performing and demanding arrangements radically improved | lis musicianship. In 1925 Singleton moved to Chicago, where his most significant playing took place over a five-year period. First, he worked with clarinetist Jimmy Noone (1925—26), most notably at a club called The Nest in a trio that included pianist Jerome Carrington. To take the pressure off his colleagues, Zutty began taking chorus-long solos that were organized to reflect the song material. 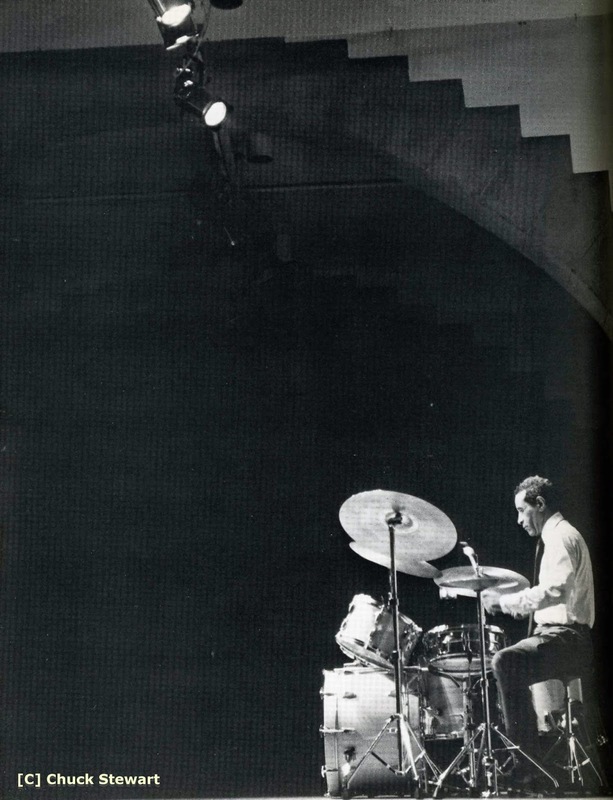 Although extended drum solos became commonplace a decade later thanks to the pyrotechnics of Gene Krupa, Singleton's emergence from a backup role to a soloist was boldly innovative. The group at The Nest acquired a following that included a young Benny Goodman, the composer Maurice Ravel, and the poet Carl Sandburg. Next, Singleton replaced Baby Dodds in Armstrong's Hot Five and Hot Seven recording bands. With his lighter style and adoption of the new wire brushes (rejected at that time by Dodds), Zutty was able to contribute more fully to the recording process than drummers before him (Louis Armstrong—Earl Hines, 1928, Smithsonian Collection). On the earliest of these tracks, Zutty merely punctuates the music with a high-pitched cymbal, but by December of that year it was discovered that placing a mike under the snare, with Zutty on brushes. made the drums recordable. On some tracks he keeps time for a chorus on the large ride cymbal, a technique that few other drummers adopted until the 1930s. In two sessions with Jelly Roll Morton and Barney Bigard (1929), Singleton's neat, swinging brushwork and remarkably modern feeling is even better preserved (Giants of Jazz: Jelly Roll Morton, Time-Life). From 1930 to 1935, Singleton was the house drummer at the Three Deuces in Chicago, perhaps the nation's first jazz club. When Art Tatum came into the club with his own drummer, Zutty moved back to New York. where his headquarters became Nick's in Greenwich Village. During the late 1930s, he accompanied and recorded with Sidney Bechet, Lionel Hampton, Roy Eldridge, Mezz Mezzrow, and numerous others. Shortly after the Goodman quartet broke the color barrier, Singleton was the drummer in another early racially mixed group, led by Mezzrow; it included Max Kaminsky, Frankie Newton, and Sidney DeParis. Zutty's popularity drew him into the film Stormy Weather (1943), and after his trip to Hollywood, that became his home for ten years. As usual, he became the backbone of a local jazz club, this time Billy Berg's. Zutty helped arrange for Charlie Parker and Dizzy Gillespie to play there in 1945. For the remainder of his long career, Singleton free-lanced in Los Angeles, Europe, and finally again in New York, where he lived with his wife in an apartment overlooking Birdland. In 1969 he suffered a stroke that left him unable to play. He died six years later.